An extraordinary picture comes down to us from an 1872 article describing a visit to Westmalle Abbey. By the second part of the 19th century, a small genre of travel literature was visits to a Trappist monastery. Numerous examples can be found in English and French magazine and book publishing of the period. They are most revealing of the way the monks lived and did their physical and spiritual work then. In spite of their black gowns and blue-collars, they are as jolly over their ale as if they were a company of English farmers at an inn…. The brew of which the hospitable father is so lavish, is inferior to none other in King Leopold’s dominions … one considerately shows one’s appreciation by grave laudatory remarks and repeated raids among the bottles, of which there stand a whole regiment in loose order on the table. Usually references to beer at monasteries, then and certainly now, are made in a restrained fashion. One almost never reads that good enjoyment was taken in the drink, as the suggestion of it would seem at odds with the spirit of privation and other-worldliness which characterizes religious retreats. Yet in reality life was not so simple, at least not at all brewing monasteries. John Macdonald was prepared to be honest with his readers on the point, although his essay makes amply clear too that monastic life at Westmalle was highly spiritual and also well-organized in the physical and intellectual labours which supported the community. These included farming, brewing, wine-making, shoe-making, laundering, teaching. Michael Jackson, in his own courteous way, once hinted at something of this nature, he was referring to an abbey’s beer which was only drunk at special occasions, but was told one monk liked to take a glass each morning at 10:00 a.m. The host imparting the information was non-judgmental. Even in the hyper-idealistic environment of the monastery, humanity is always present. Macdonald for his part surely was aware of the popular image of the monk in England, the “merrie monk”, and perhaps was playing up to that, but his account has the ring of truth read in the context of the full account. Macdonald also describes Westmalle’s hothouses where grapes were grown for wine. The grapes were grey-green in colour, he said. He likened the wine to sauternes. This wine was obviously made from the Muscat variety, indeed this is still grown in Belgium and sometimes added to beer for some extra fermentable sugar and flavour. (It occurs to me now that Westmalle’s early cultivation of grapes and cereals perhaps led to experiments which led to this interesting wine-beer hybrid). Macdonald gives a lyrical description of the abbey wine vaults and pictures himself in “shirt-sleeves”, with chair up against the wall enjoying a “sparkling” drink from the “casks and casklets” and “bird’s-eye”, a form of pipe tobacco. One form of muscatel is sparkling, the “d’asti”, so it all ties in. However, he makes it clear the monks did not take Bacchic pleasures. The wine was reserved for guests and sold to buyers outside. What grains was Westmalle’s beer made from in this period? No information is available to my knowledge. In “Essai sur la Campine Anversoise“, 1853, by George Podesta, the writer calls (at pg. 64) the abbey’s beer “the best beer in Belgium”. This was three years before its dubbel was inaugurated, yet already its beer had renown. Podesta stated that the fields of the abbey grew “wheat, rye and oats”. There is no mention of barley. Barley beers of various kinds were brewed commercially throughout Belgium, and in particular “bière d’orge” (barley beer) was a well-known type of Antwerp and its hinterlands, of which Westmalle’s domains form a part. This beer was fairly weak, brown, and usually sour according to a number of contemporary accounts. De Koninck, the famous beer of Antwerp, is a descendant of this beer, albeit it lost the sourness on the way – not a bad thing, IMO. Trappist beer, from my historical researches, was not sour, and in fact there is specific evidence to this effect regarding Westmalle which I will discuss in another post. But albeit not sour, if not made from barley, it might have resembled one of the saison beers of today which aren’t sour. If made from barley, which evidently was available to those who wanted to brew from it, it may have resembled De Koninck of today except that Westmalle’s dubbel, from 1856, was stronger. The achievements of the Westmalle monks are described vividly by Macdonald – his essay is every bit like a modern travel documentary except that words substitute for the images. The success of Westmalle is all the more remarkable given what the fathers had to work with: thin, sandy soil in one of the least productive parts of Belgium, the Campine. When monks were given land by state or nobility to work it, it wasn’t always fecund; the reverse was more usually the case. But monks were looked to for their knowledge, resourcefulness, and dedication to make unforgiving land productive. They often succeeded where secular farming didn’t. Westmalle’s venture began in 1796, faltered with the convulsions of war and displacement, resumed in 1815 and grew steadily from that time with brewing commencing in 1836. Westmalle is today the very picture and image of monastic brewing. 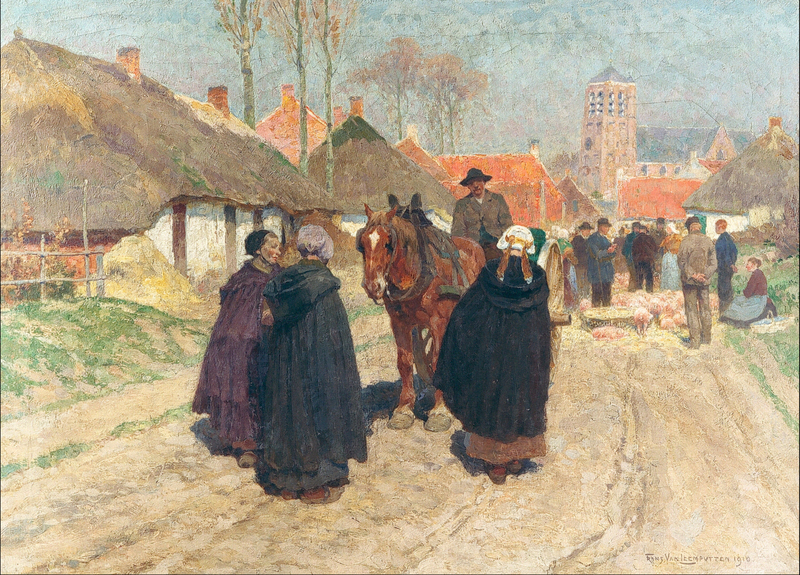 Note re images: The first image, a painting from 1910 by Frans van Leemputten entitled Market Day In The Campine, is in the public domain and was sourced here. 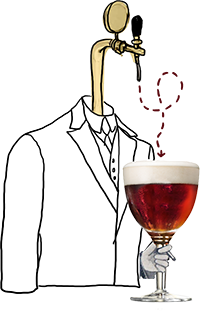 The second image, of a glass of De Koninck beer with accompanying illustration, is from the brewery’s website, which I linked in the text above. Both are believed available for educational and historical purposes. All feedback welcomed.